The events of the weekend begin on Thursday, April 16 2015 with a screening of K. Ch., the documentary recording the hardships of Karla Charvátová’s time as a political prisoner under Communism and how that time haunted her for years to come. After the screening Ms. Charvátová and Hana Truncova, another former prisoner, joined the assembled crowed of staff, students, and interested parties to share their memories and discuss how their stories relate to current issues within the Czech Republic. These women, both of whom have had their lives ripped apart by their imprisonment, bravely share their stories because they believe it is information that needs to be known. Ms. Truncova, far from being cowed by her hardships, brims with life and fire as she talks. She stands whenever she speaks, and she has a riveting presence that belies her small stature. Ms. Charvátová is quieter as she speaks, but her words carry just as much weight for it. The following day seven NYU students guided by Mr. Bouška set out for Jáchymov, the site of numerous forced labor camps based around the area’s uranium mines. First the group tours one of the old mines where political prisoners worked alongside criminal prisoners and civilian workers. 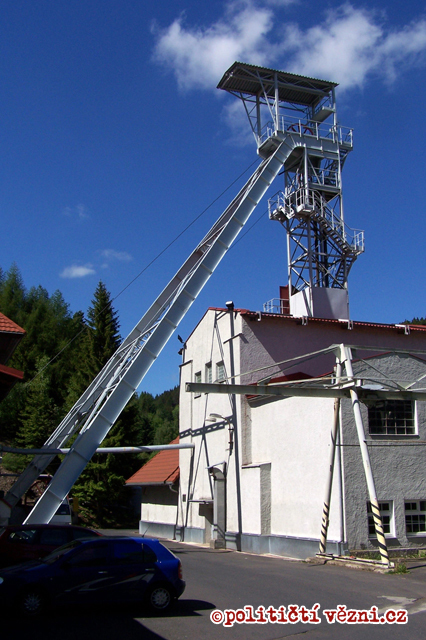 As they are guided through the mine by a lifelong resident of Jáchymov, a contrast that will hold for the entire trip becomes apparent: Some believe that these are old memories better left unturned, that some injustices are better allowed to fade out of memory rather than leave a town haunted by its past. However, that is exactly what Mr. Bouška’s group is trying to prevent. From there, the group makes their way along the soon to be restored Knowledge Trail, along which lies the sites of labor camps Rovnost, Svornost, and Nikolaj. The beautiful mountain landscape is a stark contrast to the dark past of the area. For stretches of time the hike could be mistaken for a recreational walk, the illusion broken only by the occasional informational sign. The camps themselves have long since faded from sight, covered by grass and trees, and their remnants become apparent only when pointed out by Mr. Bouška—the concrete cell used for solitary confinement; the treacherous stairs leading from a camp to the mines; the footprint of an old guard tower. “Maybe,” says another, biting her lip, considering. As the hike along the Knowledge Trail progresses, the group discusses what it means to be a political prisoner and modern political prisoners in Russia and China. At the end of the trail, the group stands in the long-ignored changing room of one of the mines, surrounded by cottages built on an area with a history that is fading from memory, and drinks a coffee substitute given to prisoners in memory of those who have suffered here. Once night falls, Mr. Bouška and the students release lanterns honoring of the victims of The Holocaust, the political prisoners under Communism, and modern political prisoners around the world. The following day the students meet former prisoner Mr. Mandrholec and gather to hear his story in the Red Tower of Death, so called for the fine red dusting of uranium that covered and destroyed the health of those working there. Among his story of injustice are also the occasional tales of kindness, such as the story of a civilian worker who risked everything to help him. “I think we can learn from history,” Mr. Bouška says towards the end of the trip. And in the end, I’m inclined to agree. It’s a long road that skips and loops back on itself time and time again, but in the end, maybe we can learn from history. The first step in doing so, however, is ensuring that history is recorded and that the memories of those who have suffered injustices at its hands do not slip by forgotten.